I'm selling an M1 Carbine Night Vision scope. I never tried to make the night vision scope work. I don't believe that the battery has ever had acid poured on it to make it work, but I'm not certain on this. Scope is dated 6/23/51. Note: M1 Carbine is not included in the sale. It is included for illustration purposes only. The people at Skybeam (formerly Wispertel) are so idiotic it pains me. Any time you call for technical support and get a woman, you should just hang up. Call back and hope to get someone competent on the next try. The idiotic brain-dead woman I talked to couldn't explain how to set up my Wispertel email address on an iPhone, and didn't think that they should know how to, to boot. So, without further ado, I'll figure it out on my own and post it here, in a public forum, on the off-chance that some other poor soul might find the information useful. The problem started when I changed my mail password. Since then, I haven't been able to send emails from my iPhone 4S. Receive emails? Sure. No problem. Send them? Not so fast there buddy. So, I deleted my email account from my iPhone, and I'll try to add it back now. iPhone 4S running iOS 7. Settings - Mail, Contacts, Calendars - Add Account - Other - Add Mail Account. Click on "POP" instead of "IMAP". POP should be blue now, to indicate it's selected. Use SSL - Turn this "Off". Authentication - Click on this and select "Password" on the following screen. Everything should "verify". You should see a lot of check marks on the right-hand side briefly, to indicate all was successful. Cannot Send Mail - The user name or password for "SMTP:billy@wispertel.net@smtp.everyone.net" is incorrect. So, I tried deleting the username and password from the Outgoing Mail Server. Cannot Send Mail. A copy has been placed in your Outbox. The recipient "billy@wispertel.net" was rejected by the server. Settings - Wispertel....Uh....ah....interesting. So, after I've configured the Outgoing SMTP Mail Server properly, it pretty much doesn't show up any more. So, this is interesting. Under "Other SMTP Servers" it has my SMTP server listed, but it says "OFF", for whatever reason. I dunno why this is. I'm assuming it's a bug in iOS 7.0. 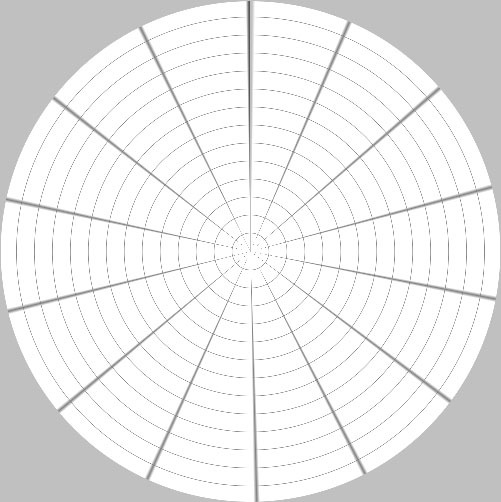 Let's assume that, in the grid above, the shapes is a square and the dimensions are 140 x 140. So, the total area of the square is 140 x 140 = 19,600. 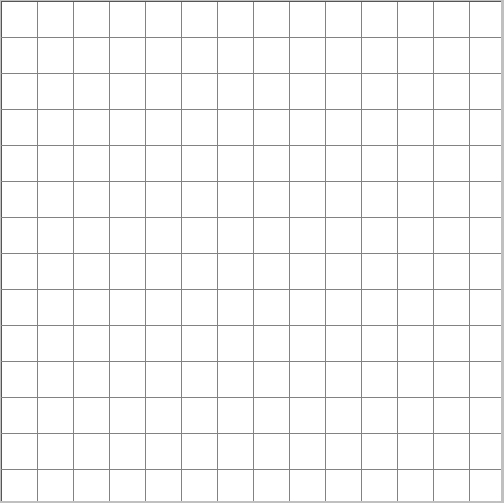 The large square is subdivided into smaller squares in a 10 x 10 grid. The smaller squares are each 14 x 14 = 196. There are 100 of the smaller squares, and 100 x 196 = 19,600, so our math works out so far. Then we do our Polar Transformation, and end up with something like the image below. The snow in the winter carpets the ground. I stay in bed for as long as possible. Finally, some time around 2 in the afternoon. The winter snows channel the birds to my black oil sunflower seed feeders. The feeders are in a poor state. Probably they're all 13 years old and every fall the bears rip them down from the eaves - straightening out the hooks that suspend them, and smashing them to bits on the ground. They want the seeds so they can sleep through the winter. I glue them back together, and hang them back up. But in the summer, the raccoons come, and rip them down as well. Smashing them to pieces. And I put them back together with nails, screws, staples, and glue. Too cheap to replace them. The animals can't be reasoned with. They show no remorse for the state of my feeders. The cats, also, don't seem to care that the feeders are barely hanging in there. Perched behind large picture windows, staring at the birds on the feeders. 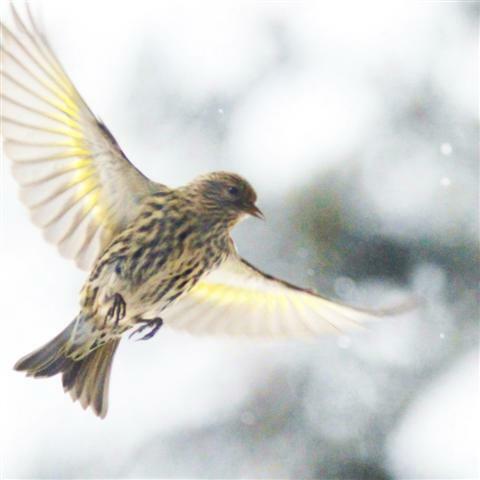 Pine Siskins. Mountain Chickadees. House Finches. Pygmy Nuthatches. Safe behind glass, the cats chatter like squirrels for reasons no one truly understands. I have to do something. Must escape from this frigid morass. Put on a pot of coffee, and start putting together some cameras. Mount up my largest Canon lens on a Gitzo Carbon Fiber tripod with a Wimberly head. Throw on some clothes. Jacket. Boots. "Come on cats. Let's go," I call, in that sort of delusional state one falls into after 9 months of solitary confinement. Outside, I fret with all of the little tedious settings until I'm happy with the images. The bird bath is frozen solid, and topped with 4" of snow. The cats come out into the fading afternoon sun to hide behind large stones in the barren gardens. Stalking the birds. Some lady once tended these flower beds, but that was long ago. I've never paid them any attention. Never showed them any affection. The birds, noticing the cats, fly away across the yard in short staccato busts of energy. The cats, resolved to the hunt, remain still behind the rocks. Indifferent to the birds' retreat. Committed. Stoic. I try to refill the bird bath, but the hose is frozen solid. The birds return to flit through the barren branches of the Mountain Lilac bushes. I'd once planned to cut them down, but my neighbors put me off. "Wait until the spring. You'll die when it blooms," they cautioned. They were right, of course. Finally, the cats gave up on the birds, and went into the yard to climb the trees. I promptly gave up on the birds and focused on shooting the cats. The cats don't like they snow, but they resign themselves to winter's pains, as a young man resigns himself to suffer a woman's wrath. Nothing comes easy. Everything has a cost. I shoot the cats with a smaller lens until the sun goes down. Now, the coyotes and the foxes come out in search of food. "Let's go, cats. Time to get inside." As if they truly understand me, they surrender their positions in the trees, and run to the front door. And we slip inside together, to warm up from the frozen fields, and dream of what comes tomorrow. Continue reading "Stalking the Stalkers"